Columbine is an easy to grow perennial, native to Asia, Europe and North America. Columbines produce large, showy blooms of single and bicolor patterns on airy plants with blue-green foliage from late spring to early summer. Colors include shades of yellow, white, pink, blue, purple and combinations. Once Columbine are established, they will grow well and bloom until frost. The name “columbine” comes from a Latin word, “columbinus,” meaning “dove-like.” These flowers were associated with the dove of peace, but also with the fierce eagle. 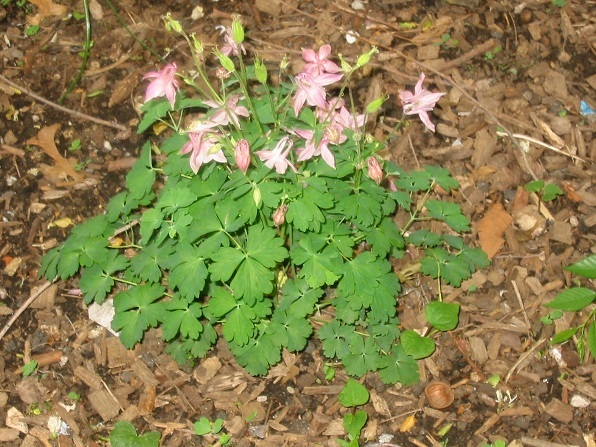 The genus name, “Aquilegia,” comes from the Latin word, “aquil,” meaning eagle. The five spurs at the back of the flower suggested an eagle’s talon. Native Americans used to eat columbine flowers in small quantities, and used infusions medicinally for ulcers, fever and as an antidote to poison ivy – though the seeds and roots of the columbine are themselves poisonous. Nevertheless, some moth caterpillars can feed on these plants without harm. Hummingbirds also like them.